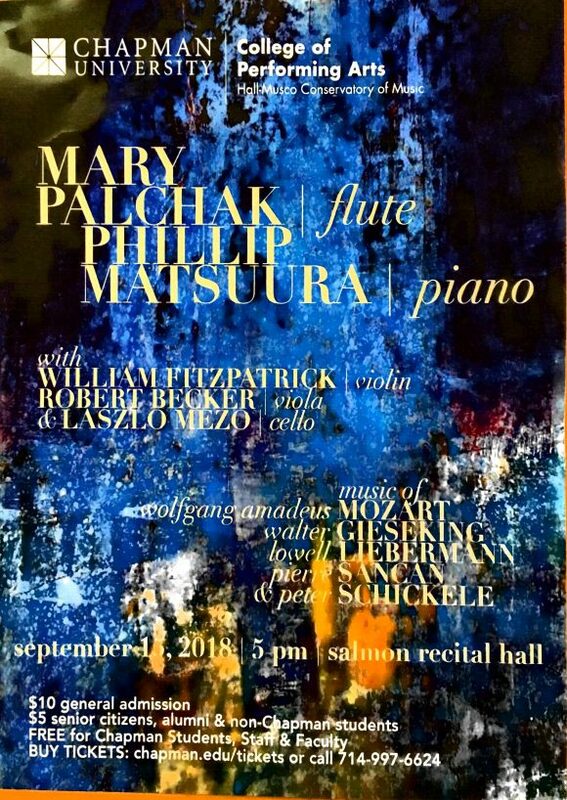 The Hall-Musco Conservatory of Music presents a faculty recital with Mary Palchak—flute and her son Phillip Matsuura—piano, with fellow faculty members William Fitzpatrick—violin, Robert Becker—viola, and Lazlo Mezo—cello on Saturday, September 15, at 5 p.m. in Salmon Recital Hall. Program includes works by Mozart, Geiseking, Lieberman, Sancan, and Schickele. Tickets just $10 general admission, $5 seniors, alumni, and non-Chapman students, and FREE for all Chapman students, staff and faculty. Works by Mozart, Giseking, Libermann, Sancan and Schickele. Visit chapman.edu/tickets. Mary Palchak and Phillip Matsuura perform a concert with Chapman music faculty on September 15.